Word sketch difference is used to compare and contrast two words by analysing their collocations and by displaying the collocates divided into categories based on grammatical relations. Why use the Word Sketch? The Word Sketch is a real timesaver, negating the need for reading thousands of concordance lines to draw conclusions. All information is readily available from one screen only. 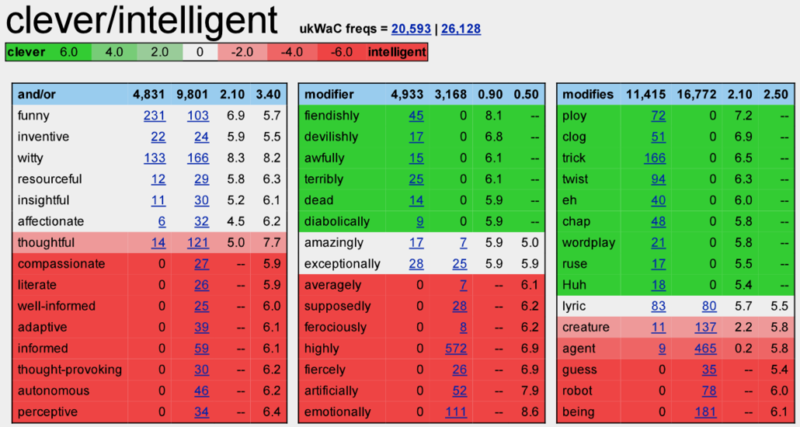 In the screenshot below, Sketch Engine assigned the green colour to clever and the red colour to intelligent. Green collocates are more closely related to clever, red collocates to intelligent. Stronger colour indicates stronger collocations, e.g. it is more usual to say clever trick than intelligent trick, on the other hand, it is more natural to say intelligent robot than clever robot. White colour means similarity. Generally, the colour of the collocates is determined by the difference between the scores for the collocate with these two compared words (e.g. clever/intelligent). How to generate a Word Sketch Difference? 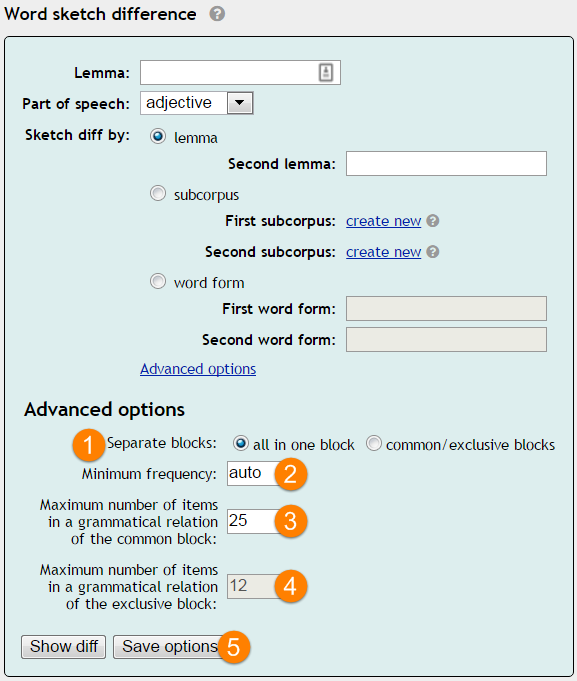 subcorpus (5) use this option to compare the behaviour of the same word in two different subcorpora, e.g. written or spoken language or academic and general language. Use the links to create new subcorpora. 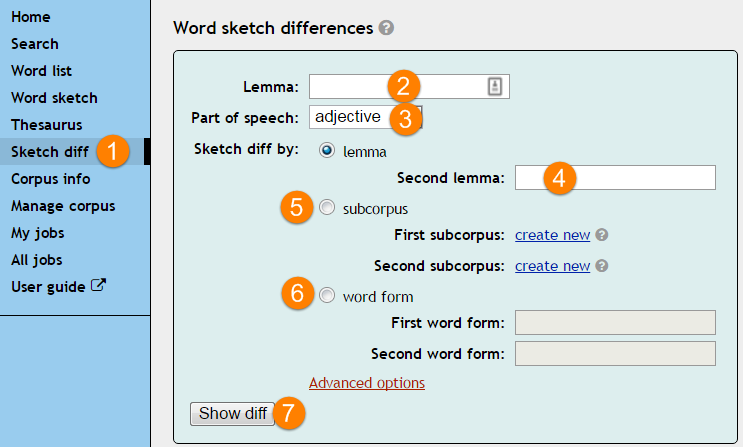 To use this option, only type one lemma in (2) and select the two subcorpora to compare. The statistics used in Sketch Engine to calculate word sketches is described in this document. THOMAS, James Edward (2015). Discovering English with Sketch Engine (DESkE), chapter 9 Word Sketches, pp. 161–176. Semantic Word Sketches (presentation). Diana McCarthy, Adam Kilgarriff, Miloš Jakubíček and Siva Reddy (2015). InCorpus Linguistics (CL2015). Finding Multiwords of More Than Two Words. Adam Kilgarriff, Pavel Rychlý, Vojtěch Kovář and Vít Baisa (2012). In Proceedings of the 15th EURALEX International Congress, Norway, pp. 693–700. A Quantitative Evaluation of Word Sketches. Adam Kilgarriff, Vojtěch Kovář, Simon Krek, Irena Srdanovic and Carole Tiberius (2010). In Proceedings of the 14th EURALEX International Congress. The Netherlands, pp. 372–379. Towards disambiguation of word sketches. Vít Baisa (2010). In Text, Speech and Dialogue. Germany, Berlin: Springer-Verlag, pp. 37–42. The articles relating to individual languages can be found in the Bibliography section (e.g. Arabic, Chinese, Polish, Japanese, etc).